In Windows 10, users can change the opacity level of a console window to be between 30% and 100%. This tutorial will show you how to change the transparency (opacity) percentage level of a console window (ex: command prompt, PowerShell, Linux) for your account in Windows 10. The transparency level you set for a console window will only be applied to the specific console window shortcut that opened it. If you set to use legacy console, then the Opacity feature and setting will be disabled and grayed out. The transparency (opacity) level you set using this option will only be temporary, and only used while the console window is open unless you use Option Two to set the current transparency level as default. 1. 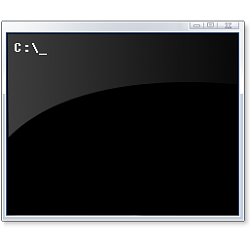 While you have a command prompt, elevated command prompt, PowerShell, elevated PowerShell, or Linux console window open, press the keys below until you have the transparency level you want. 1. Open a command prompt, elevated command prompt, PowerShell, elevated PowerShell, or Linux console window using the shortcut or location you want to change the opacity for. The default opacity is 100%. The lower the percentage you set, the more transparent the console window will be.